The Smart Toast, with motorised Fruit Bread, Lift & Look and A Bit More automatically takes the guess work out of toasting times for different bread. 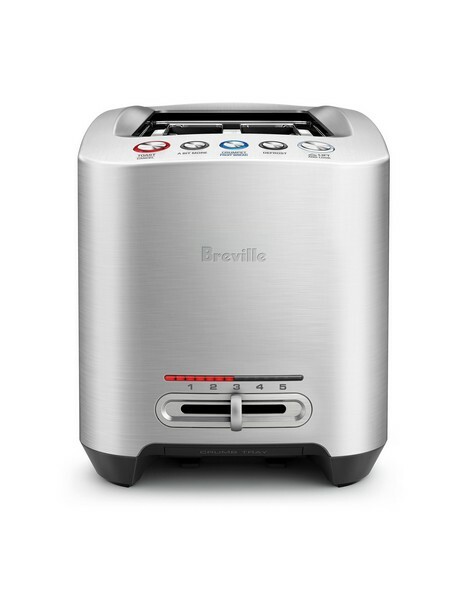 Using the elegant push button controls, the 'Fruit Bread' setting adjusts toasting time to help prevent burnt toast. ' Lift & Look' activates the motorised carriage to gently raise the bread just long enough to check if it's done. Press 'A Bit More' and the carriage lowers once more to give it just that a little bit more. Follow toasting progress with the LED countdown indicator. Crafted with full die-cast construction, this toaster also includes automatic raising and lowering, crumpet and defrost settings.